Seaweed is a seasonal medium and as such, specific species are only available when “In Season” through out the year. This means that my pieces are unique and limited to what I am able to create in any given season. Once a piece is gone, I may not be able to create a similar piece until the seaweed used is again in season. Each of these works is a treasure from nature, and like all ‘living’ things they tend to mellow with age. To retard this process, Please keep this artwork away from direct light sources. 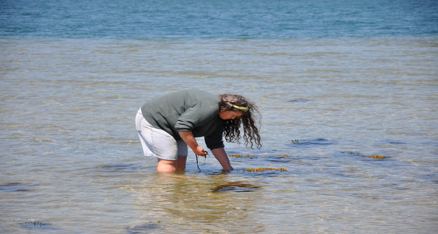 Growing up on the island, I learned to mount seaweed from my father as we collected and classified (Algae) for teaching purposes. I acquired an understanding of individual seaweeds and their properties, and continued to pursue these interests in Aquatic Environments at Allegheny College in Meadville Pennsylvania. Later, while teaching at Harvard University, I had the opportunity to start showing my work to the public. Interest in my art continued to grow and has led to the inclusion of my work in private collections across the country and abroad. Since my return to the Vineyard, I’ve received awards for my collage work, and am currently showing at The Old Sculpin Gallery, Featherstone Center for the Arts and the on Thursdays during July and August at Vineyard Artisans Festivals. I like to think of Seaweed as a medium as well as beautiful specimens to be mounted on paper as they occur in nature. In my collages or “Paintings”, I’ve merged an understanding of the limitations of my medium with the possibilities for self-expression. Creating images of nature from natural materials. I have always been most comfortable in and around the water, and this medium allows me to spend time on the shoreline collecting and observing the seaweeds movement in its natural state before returning to the studio. The process of creating these images is as important to me as the finished work. I use the wet seaweed to create the image and as the seaweed dries, it’s own adhesive bonds it to the paper. I may have a vision for a given piece, but ultimately I listen to the seaweed, and the finished pieces reflect that balance. They range from abstract to more pictorial depending on the specifics of the seaweed I am working with at any given time.